The Bible is the standard for Christianity. It is the only way to know Christ and His salvation plan. As believers, the goal of our faith is to understand and participate in this plan by carefully studying God’s teachings contained in the Bible. The World Mission Society Church of God hosts numerous Bible studies and seminars on various topics to guide those interested in seeking Christ to the way of salvation. Continue reading for a preview of the beliefs of the Church of God. The Church of God observes the Sabbath day on Saturday according to the teachings of Jesus Christ (Luke 4:16) and the apostles of the Early Church (Acts 17:2). Know the history of the Sabbath day, its importance and why we should keep it. Jesus’ last commission to His disciples was to baptize people in the name of the Father, in the name of the Son, and in the name of the Holy Spirit (Matthew 28:19) immediately after receiving the teachings of Christ. The World Mission Society Church of God conducts baptism in the three names of God. Study the prophecies of the Bible that clearly testify how God the Father, God the Son, and God the Holy Spirit are all the same one God. The Bible teaches that during prayer and worship service, men should not cover their heads in order to give glory to Christ. Likewise, women should cover their heads in order to give glory to Christ (1 Corinthians 11:2-16). The Bible testifies that Second Coming Christ would revive all of the teachings of the Early Church. Because Christ Ahnsahnghong has fulfilled these biblical prophecies, members of the Church of God believe He is Second Coming Christ. 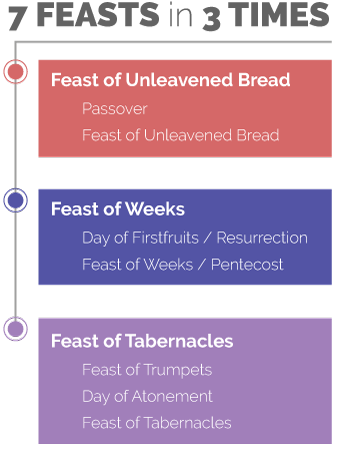 God established seven feasts grouped in three times to grant us the forgiveness of sins. These feasts were not only for the Israelites of the Old Testament, but for Christians today as well. Look on Zion, the city of our festivals… the sins of those who dwell there will be forgiven. But you have come to Mount Zion…to the Church of the firstborn, whose names are written in heaven. To receive this great blessing from God, we must go to the place God established, which is Zion (Ps 102:16), recognizable through the feasts of God. God the Father gave the Israelites the Passover in the Old Testament for their blessing. Jesus Christ established the New Covenant Passover in the New Testament and commanded His disciples to celebrate it (Matthew 26:19). The Passover contains blessings that are relevant to Christians today. The Feast of Unleavened Bread represents the suffering Christ underwent from the night of the Passover until His death on the cross. In the Old Testament, the Israelites kept this feast by eating unleavened bread. In the New Testament, Christians are to share in Christ’s sufferings by fasting. Resurrection Day is celebrated on Sunday every year and marks the day Christ rose from the dead. By His resurrection, Jesus fulfilled the Feast of the Firstfruits, in accordance with the prophecies of the Bible. His example inspires Christians to have hope for heaven. This feast is celebrated by breaking resurrection bread that opens our spiritual eyes to understand God’s words in the Bible. Also known as the Feast of Weeks, the Pentecost gets its name from the time of its celebration: fifty days after Resurrection Day. On this feast, Christ pours out the Holy Spirit. Through the Holy Spirit, believers are able to follow in the footsteps of Christ and preach the gospel. In the Old Testament, Israelites blew trumpets for ten days to prepare their hearts until Moses returned from Mount Sinai with the ten commandments. In the New Testament times, believers are to pray earnestly for ten days until the Day of Atonement. God established the Day of Atonement to commemorate the day He forgave the Israelites’ sins. On this day, atonement is made so that the people of God can be forgiven for all the sins committed in ignorance. The Feast of Tabernacles is a joyful feast. In the Old Testament, Israelites offered materials to build the temple. In the New Testament, God’s children are regarded as temple material (Revelation 3:12). On the last and greatest day of the feast, God pours out the Holy Spirit on all those who keep this feast.